Hey, lingered upon, happy birthday! I can hardly believe it's been a year since my first post. The last time I maintained a "blog" for this long was probably my xanga from high school, chockfull of dramatic and cryptic posts about how my life sucked. (Come on, we've all been there at some point. :P) Apparently it was my foray into film that led me to start this blog in the first place. The food stuff just happened as an afterthought - can you believe it?? As you know by now, I'm completely hooked (on film) and there's no turning back. So what's to come in year two of blogging? Hopefully better content, better pictures, more experimenting with lighting, more travel, more his and her posts (been sadly slacking on these), even more eating adventures, and more written content that you'll find useful. Some of your comments have inspired some gear turning in my head for what else I could put on here, besides the flowers, the food, the coffee, the wooden tables... but I hope you'll forgive me if those still find their way on here more often than not! I did want to do the cliché bit and host a little giveaway, but I am still working out some minor kinks in the uh, logistics, so I will be doing it a little belated in the coming week or so. Hope you'll stay tuned. I must say I just found out about you around november or so, but you won me over, that's for sure! You're currently one of my top favorite bloggers and photographers! Your work is truly inspiring and I get all happy and excited when I see on my RSS reader that you have a new post out. So, Thank YOU for being there and writing and taking photos for us. =D happy birthday, lingered upon! Congratulations Alice!! I'm excited to see what Year 2 brings! 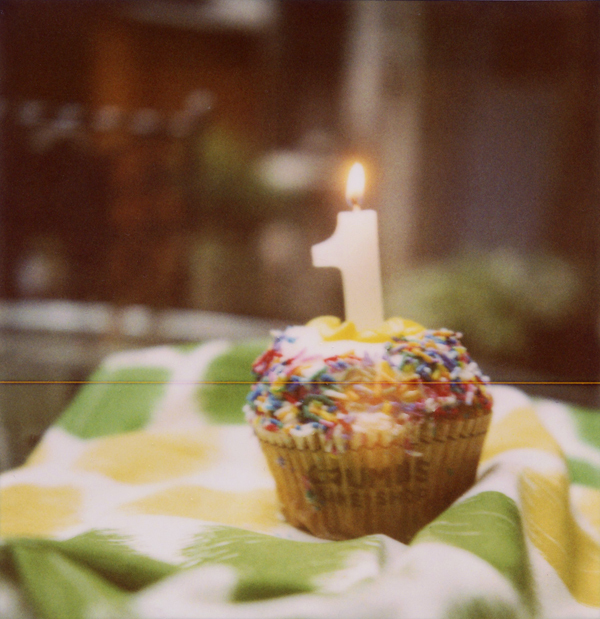 Happy birthday to your blog, and congratulations to you for making it through Year One! Looking forward to the next year(s), wherever that may lead you. And us. Can't believe your beautiful, must read blog is only one year old! I think I've been with you for most of the year. It has been a pleasure to share your journey with you. I just know with certainty that you are going to go onto great things and I'm excited to watch it happen. Congrats! Enjoy your writings as much as I love your photos. Hooray for one year, and double hooray for many more to come! Yay Alice, congrats to 1 year! :) This upcoming year will be even better! More photos, more inspiration, more FOOD! yay! :) happy birthday lingeredupon! That has to be such an awesome feeling :) I have loved stopping by your blog and I've enjoyed all of your pictures. They inspire me to at least start taking more picture with the camera I have now and getting a disposable one and finding out what kind of magic I can make ;) I look forward to more posts from you!! Congratulations on your 1 year blog anniversary!! I just recently started following your blog, and I can't wait to see what you come with in your second year! You take beautiful photos! Happy B-day! Hope you enjoyed the cupcake! I always enjoy reading your post & viewing your photos, can't wait to see what the next year brings! Congrats Alice! Maintaining a blog (a photo blog, no less) is hard work. Most people's enthusiasm seems to start heavy and die out somewhere along the way... Needless to say, we're all very happy you're not one of them. Looking forward to the next year's worth of posts! Happy blog birthday and congrats on a great year! Can't wait to see what's to come in the next one, and beyond!! that cupcake is looking good! Happy Blog Birthday #1 Alice!!! :D I hope you continue to write & shoot for many more! happy, happy blogiversary! looking forward to seeing what year 2 brings. Congratulations on your first year. I rummaged in channels past articles, I like them all very. And I'm looking forward to next year, with more photos and reports. Happy One Year, Alice! One of my favorite blogs to read daily. Congrats! I just love your blog and your photography. Only one year? Congrats and here's to many more! Oh. I'm a bit late but still wanna wish you a happy one year on blogging :) Always enjoy the lovely photos you post here! happy birthday to your blog! you've done a wonderful job here, and that's why you have such dedicated followers :) definitely hoping for more his/her posts!! and btw, i love "say yes to the dress" too! much drama goes behind choosing that perfect dress, haha!